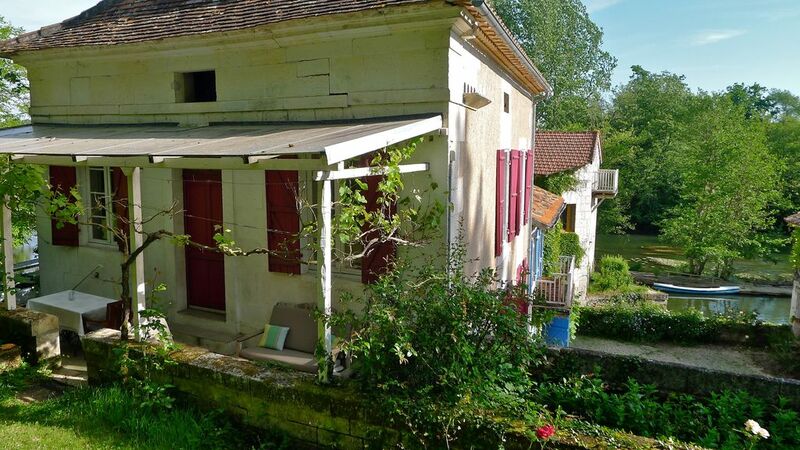 Located in the old station of Bigoussies this spacious home can accommodate 4 peronnes. It has 2 bedrooms and a sheltered terrace with a dining area and a relaxation area. The Bigoussies of mill cottages can accommodate up to 10 people in 3 fully independent structures. The cottage can accommodate up 1 to 4 persons (2 bedrooms) and has a private covered terrace. 2 The cottage can accommodate up to 3 people (1 bedroom and a sofa bed) it also has a private terrace under a gazebo. 3 The cottage sleeps up to 3 people (1 bedroom and an extra bed in the living room). This cottage enjoys an exceptional view of the river. 3 cottages have been recently renovated with contemporary comfort and will seduce you with its excellent location along the river. You get direct access for swimming, fishing or walks in canoes. Within 5 minutes of Riberac they will be many visits starting point in the region. This mill of the eighteenth, belonged to the Romanesque abbey of the twelfth of Saint-Saud-Lacoussière above Brantome. Probably built on old foundations we find on maps Cassini XVIII; its architecture is the nineteenth century. It becomes an eel fishery in the late nineteenth and the refuge of a historian, writer, before opening up to you on the Dronne. Water quality is exceptional, it is a perfect place for fishing or walks. Cleaning end of stay 40 € mandatory and included in the price. Lovely house, peaceful and relaxing. The property is part of a water mill on the banks of the Drone. 2 bed house is well equipped and comfortable with a private terrace. It is very peaceful, relaxing place. We used canoes provided by Nathalie and had great swimming days. Plenty to do in the area around including cycling. A great location. Nathalie and Thierry were very helpful and kind to us and didnt intrude at all. We had free access to the canoes and could sit by the river, but the recent heavy rain meant we drove 20 mins to Lac Jemaye to swim. This has a good beach and can be busy, but fine if you choose your time. We also enjoyed cycling around quiet and pretty local villages with their fine Romanesque churches, visiting the abbey caves at Brantome - though the village is a bit touristy. The village of Aubeterre , though very beautiful and with an extraordinary 12th century rock hewn church, did not seem overwhelmed by tourism. Nor did the area generally, unlike parts of the Dordogne further South. Lovely little cottage with beautiful views outside of the river. Very warm welcome from Nathalie and all of the facilities you need for a comfortable stay. We had a really enjoyable long weekend and the cottage is ideally placed for lots of lovely villages and towns in the area. Accueil agréable, et attentionné (confiture maison et café disponible à notre arrivée et mise à disposition de bois de chauffage). La propriétaire a été réactive pour remplacer le boitier de la TNT tombé en panne. Elle a su rester discrète bien qu'habitant sur le site. Nous avons passé un bon séjour. Après un accueil très sympathique et convivial de la propriétaire, nous avons eu le plaisir de profiter de ce charmant gîte. Quel plaisir de bouquiner dans le jardin verdoyant et fleuri tout en contemplant la Dronne qui coule à nos pieds. Les poules caquettes autour de nous en toute liberté et c'est très agréable. D'ici, les excursions vers Brantôme, Bourdeilles, St jean de Côle, Aubeterre etc... sont aisées. Nous avons beaucoup apprécié cet endroit. Bonne adresse. N'hésitez pas à la découvrir. The ancient city is proud of its many festivals and exhibitions. Located in the heart of Roman churches circuit. Etang de la Jemaye at 15 km. Aubeterre, holder of the label "most beautiful villages in France 'about fifteen Km. Brantome nicknamed 'the Venice of the Perigord' is less than half an hour. Possibilité de court séjours de 2 nuits hors juillet et aôut, caution demandée, acompte/arrhes à la réservation, remise des clés par le propriétaire.